Cross slab monuments generally receive little attention. They are usually regarded as anonymous memorials, which probably commemorate priests. In fact they memorialised both the clergy and laymen. Most of those cannot be identified by name but the example discussed here is an exception. 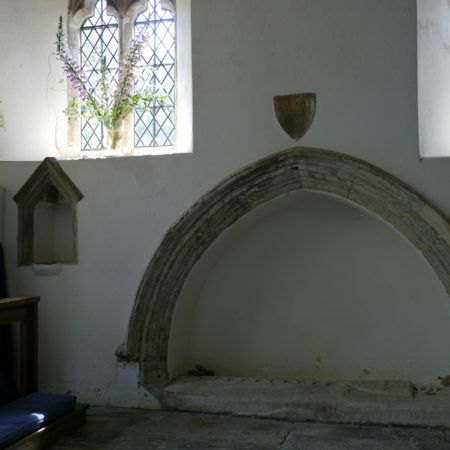 The south chapel of Whichford church was built about 1330 by the de Mohun family (Fig. 1). There is an altar at the east end, a piscina in the south wall and a doorway to the outside in the south wall. This has a shield over it, the arms of which are effaced. 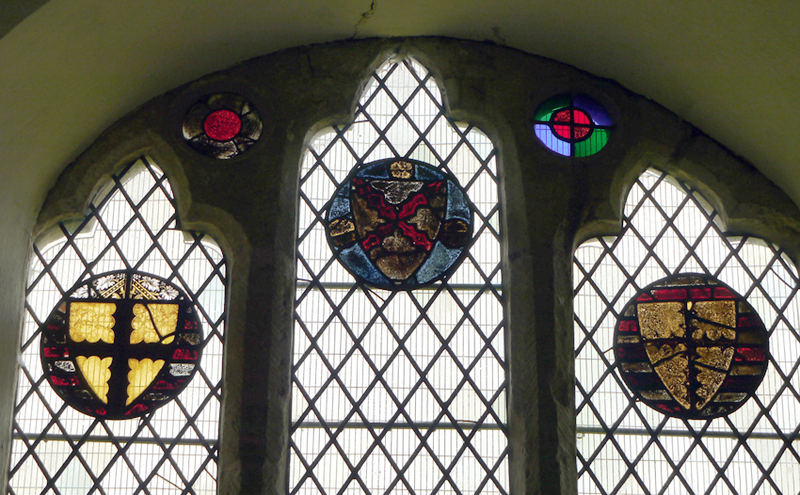 Most of the glazing in the three windows has been lost, but arms of the de Mohun family (Or a cross engrailed sable) remain both in the chapel (Fig. 2) and elsewhere in the church. 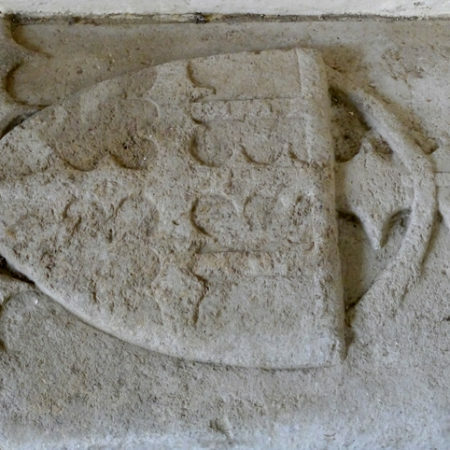 An arched recess in the south wall has a blank shield above; this was presumably originally painted with the de Mohun arms. 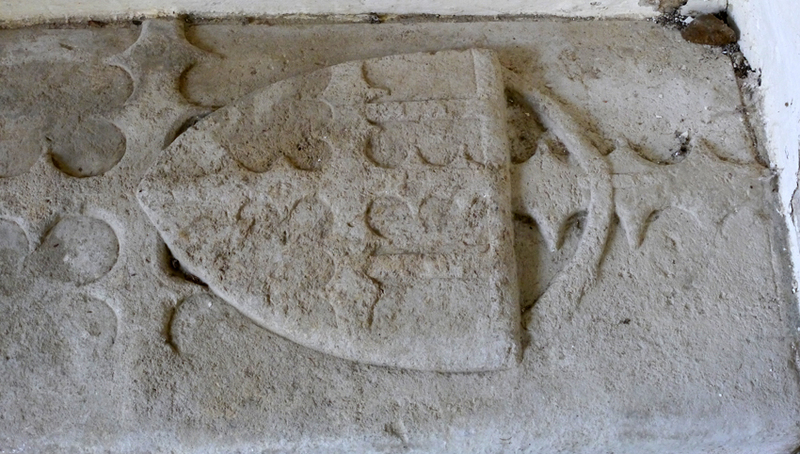 Within is an unusual heraldic cross-slab with a stepped calvary (Fig 3). 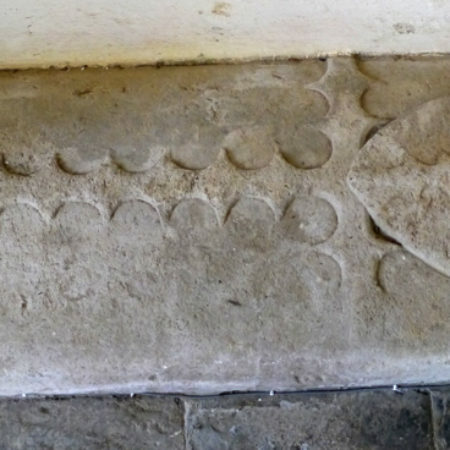 The low relief cross itself is engrailed, reflecting the de Mohun arms. High on the head of a cross is suspended a shield (Fig. 4). This bears a variant of the de Mohun arms; it has a label, which signifies that it represents an eldest son who died in his father’s lifetime. Although there is no inscription, it is not difficult to establish who is memorialised by this monument. In 1204 King John granted the manor of Whichford to Reynold de Mohun, to whose widow Alice land in Whichford was assigned in 1215. It then descended in this family, one knight’s fee here being held in 1235 by Reynold de Mohun, who had a grant of free warren in 1253. John de Mohun was lord of Whichford in 1279. In 1305 the manor formed part of the settlement of John son of John de Mohun on his marriage with Christiane daughter of John, Lord Segrave. 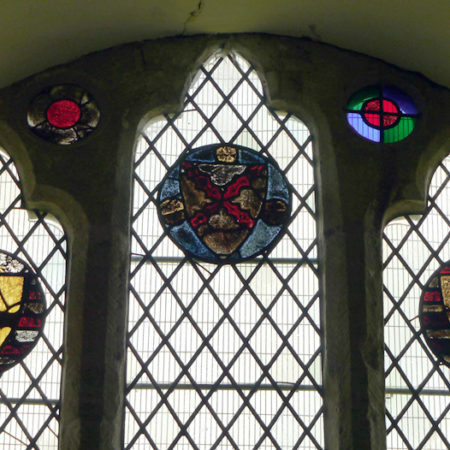 In 1316 their son John de Mohun, 1st Baron Mohun, (1269–1330) was recorded as lord of Whichford. He married Anne Tiptoft, daughter of Paine Tiptoft, by whom he had numerous issue including his eldest son and heir apparent. 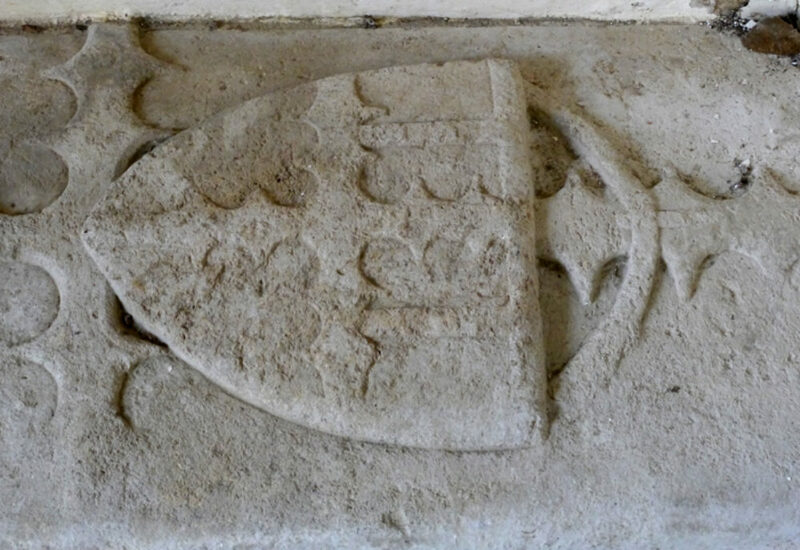 This was John de Mohun (died after 1322), who predeceased his father, having married Christiana Segrave (died 1341), daughter of William Segrave. He fought at the Battle of Boroughbridge in 1322 and died some time after in Scotland. This is evidently the person commemorated by the monument at Whichford and the chapel may even have been erected to house his remains. 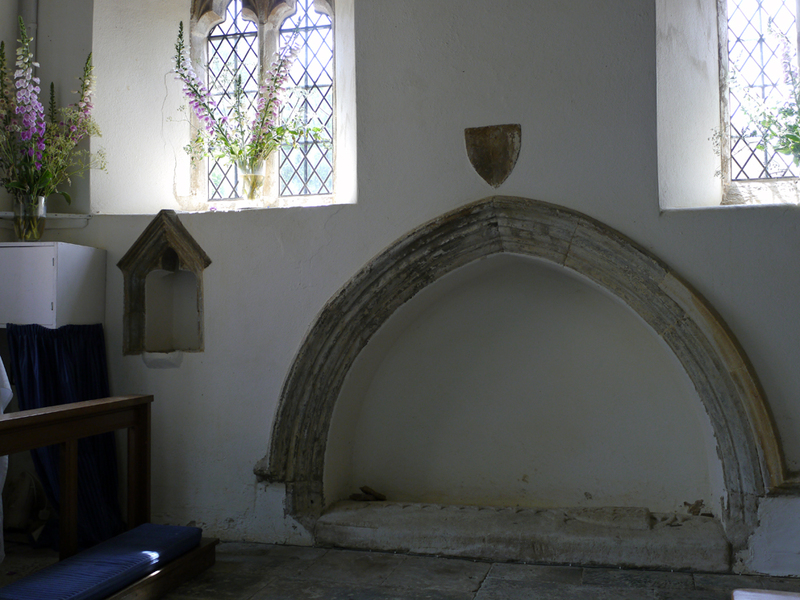 It was probably a chantry chapel, although no record can be found of the establishment of a chantry at Whichford. Why John de Mohun was buried here rather than at his father’s seat at Dunster (Somerset) or in Scotland is unknown.